Back of the Cereal Box: Name That Gargoyle! Today I’m picking up a subject I’ve left alone for a while: words and video games. My goal is to use the power of the internet to answer a little linguistic mystery that has puzzled me for a while. A short video game history lesson: Back in the day, Capcom (the people who made Street Fighter) released a side-scrolling arcade game, Ghosts ’n Goblins, which featured a knight hopping through what essentially amounts to a tacky Halloween haunted house landscape. Being a coin-operated game, the head-bashingly difficult Ghosts ’n Goblins aimed to overwhelm the player with countless undead monsters, assuredly killing the knight and forcing the the player to dump quarter after after quarter into the machine in order to progress. Despite that, the game caught on and spawned a lot of sequels and spin-offs, including some that starred the original game’s first-level boss, a nasty red gargoyle. 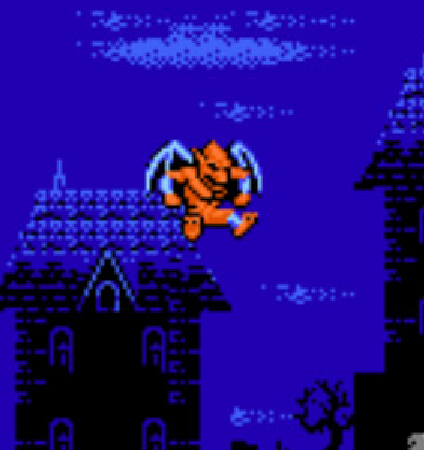 In the spin-offs, you could even play as the gargoyle, jumping around, doing typical gargoyle stuff. As it stands now, the gargoyle may have appeared as a playable character more often that the original knight protagonist has. And, finally, the confusing part: For the life of me, I can’t figure out what this name means. I could mean nothing, sure, and it could be a Japanese word that just translates like something that looks like an English word. But given that it has the word red in it and the character itself is red, I’m willing to bet that the name is English, translated into Japanese and then reproduced back in English in a way that makes it unrecognizable. Is it some variation on ream? (Parallel thoughts: “Don’t get ruined by the word ream, childhood memories!” but also “Ha ha, ream.”) But the character doesn’t bore any holes or, you know, engage in buttplay, so I think the answer lies elsewhere. I know that translating between English and Japanese can mean the insertion of vowels in between the consonants and that whole fluidity with the letters “L” and “R,” but I can’t switch the letters around in any way that makes more sense in English. Reamle? Lemul? Lemur? Could it be Armor? Nothing. What the hell is Arremer supposed to mean? So then, internet — language-keen and video game-savvy people who frequent this blog, I’m looking at you — can you make anything from this? There is a theory that the a possible way to find obscure information online is to simply post somewhere what you don’t know and let the answer come to you, and I’m willing to try put this tactic to gargoyle-related use. After Ghosts ’n Goblins came a sequel, Ghouls ’n Ghosts, but the alliteration stopped there, unforch, but I guess forcing the pattern would have resulted in games like Geists ’n Ghastly Things We Didn’t Put in the Last Game, so maybe it’s for the best. Yeah, the apostrophe looks wrong to me too. It should be Ghosts ’n’ Goblins, since both the “a” and “d” in and got contracted into oblivion. Of course, the heroic knight from the original games is chasing after a damsel. Tragically, this game’s leading lady got stuck with the name Princess Prin-Prin, which is just embarrassing. Ask, and ye shall receive. Based on a thread on 2-chan (the Japanese version of 4-chan) and this website, it seems like Red Arremer, which can also be written Ariimaa, was named after Ghosts 'n Goblins lead programmer Toshio Arima. The thread said that Arima's face was always red due to anger, hence the demon's red color. (Apparently this is also on the Japanese wikipedia page; I should have checked there first :-/ ). Interestingly, after Ghosts 'n Goblins Arima seems to have disappeared off the map. There is a Toshio Arima presiding as the president of Fuji Xerox, but I don't think it's the same guy. Finally, arremer seems to be the demon's species, since there are also ground types, air types, and water types. Who knew?! I was going to say it was an invented name. You see this sort of thing a lot in manga. But the notion that it's based on the lead programmer's name with the vowels lengthened seems plausible. Godaigmer: Thanks so much for posting this! And for proving my theory about the internet correct. I wonder: Do you think it was intentional that they made "Arima" sound like less of a Japanese word or do you think it was just an error in translation? Goofy: When you talk about invented names being common in manga, do you mean words being repurposed as names when they probably hadn't been used as such before? Or do you mean whole combinations of syllables used for the first time? Hmm... I wouldn't call it an error in translation, per se, since there's no "right" way to translate it. The translator could have gone with Areamer, Aleamer, Areemer, etc., basically anything that lets you know that both the A and middle e are long (although as written is a little confusing). It could have been changed to look less foreign, or translated by someone in house who didn't speak English but wanted a cool (to Japanese eyes) looking word. I think it was wise for Capcom USA to change the name to Firebrand, and I'm not sure why they would change it back.